By Terry Gardner May 27, 2013, 8:15 a.m. The San Francisco Zoo’s 3-month-old Sumatran tiger cub finally has a name: Jillian. Born Feb. 10, the cub now eats solid food and weighs almost 30 pounds. On May 11, at Zoofest, the nonprofit zoo’s annual fundraiser, comedian Robin Williams assisted in auctioning off naming rights to the cub. Literary agent Jillian Manus won the naming rights to the cub with a $47,000 donation to the zoo. “I was going to donate a certain amount of money anyway and my kids started texting me: ‘Get the baby tiger,’” says Jillian Manus. She had wanted to celebrate her four children, Blake, Amanda, Nick and Brock, by naming the tiger Bicka, but her kids thought a mash-up of their names wasn’t a good tiger name. They convinced their Mom to name the cub Jillian. A rare Sumatran tiger has given birth to three cubs at an Indonesian zoo in a welcome boost for the endangered species, an official said Thursday. The big cat gave birth to four cubs at Taman Rimba zoo in Jambi province Tuesday but one died immediately, according to provincial tourism and cultural agency head Didi Wuryanto. "I'm overjoyed. This is a remarkable achievement," Wuryanto told AFP. 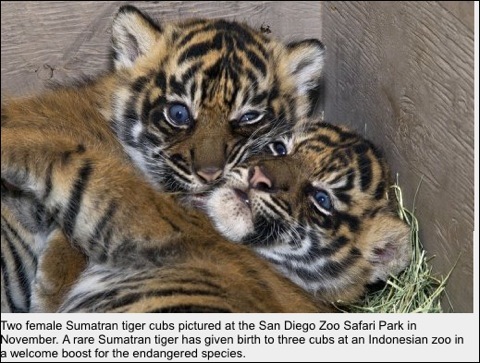 He said the parents of the cubs, male and female tigers called Peter and Uni, had been transferred to Jambi on Sumatra island from Ragunan zoo in Jakarta. 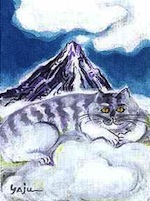 "It's difficult to take care of tigers. Thanks to the effort of the people in the zoo, there is hope now that we can help in saving the tiger population," he said. Human-animal conflicts are a rising problem as people encroach on wildlife habitats in Indonesia, an archipelago with some of the world's largest remaining tropical forests. There are as few as 400 Sumatran tigers left in the wild in Indonesia, conservation group WWF said.